WORD wishes all mothers a Happy Mother’s Day! Many of us in WORD are mothers in the struggle. We recognize the challenge mothers face in today's society, where women bear the brunt of responsibility for child rearing and childcare while food, education, health care, a job and housing are not considered rights. Whatever the gender of the parent or parents, raising children in the United States is treated as an individual or nuclear family issue, and not viewed as a collective social responsibility. For mothers in general, and single mothers in particular, the individual responsibility becomes a significant burden. The wage gap between men and women without children in the United States is 7 percent. Add a single child into the mix and that gap jumps to 23 percent. Sixty-five percent of a U.S. family's seccond wage is spent on childcare. For single mothers, and 40 percent of us are single mothers, childcare expenses come out of a single income (Forbes, 2013). The all-out assault on social services has had a disastrous impact on working families—and particularly those led by single mothers. In the mid-to-late 1800s, different groups of women celebrated special mother’s days that ranged in their purpose and organization. In 1858, Anna Jarvis organized mothers’ work days to improve sanitation with the aim of lowering infant mortality and better community health. In 1872, Julia Ward Howe—a suffragist and pacifist—established a special mother’s day for peace that continued for several years. The official U.S. holiday was adopted in 1914 when Congress passed a Mother's Day resolution. The official holiday was the result of Anna Jarvis's daughter, also named Anna Jarvis, who spent many years advocating for a special day for mothers. Jarvis insisted that it be for one's personal mother, not mothers in general. By the time it was officially adopted, the day had been stripped of almost all association with anti-war sentiments or community service. It rapidly became a highly commercialized day, profitable to a variety of corporations and used by organizations—from pro-war to charitable groups—to raise funds. Jarvis herself then spent every penny she had fighting the commodification of the Mother's Day she had initiated. During the same period that Jarvis was building support for Mother's Day, International Women's Day was proposed by working women's organizations in the United States and then in an international conference that met in Europe as a day to celebrate women's contributions and build the struggle against women's oppression. In 1913, the year before the United States Congress officially decreed Mother's Day as a holiday, IWD was moved to March 8—a day that is celebrated worldwide. Instead of isolating one group of women that have become parents, International Women's Day is a day established by working women from many different countries to celebrate the struggle of all women for full equality. Mothers deserve to be recognized for the work they do for their families—countless hours of unpaid work. But motherhood—producing and caring for children—is often venerated as the ultimate achievement for women, that which gives them value as human beings and members of society. In “Why I hate Mother’s Day” author Anne Lammott aptly writes, “Mother’s Day celebrates a huge lie about the value of women: that mothers are superior beings, that they have done more with their lives and chosen a more difficult path," (Salon.com, 2010). Placing such high value on motherhood implicitly alienates families that may not have a mother figure--families with two dads, single fathers or families that have lost a mother for some reason or another. In reality, all women face the profound effects of institutionalized sexism, of living in a patriarchal society that denies us equal access to jobs, education, housing and more. All women should be afforded the right decide if and when they want to become mamas—meaning unfettered access to reproductive rights. All women should have the right to decent housing, equal pay for equal work and a quality education. All women should live a life free of violence—whether that be domestic violence, sexual assault or bigoted attacks. If we are to make this a reality, we need to build a movement to fight the attacks on women's rights and win the rights we should be afforded. We take this Mother's Day to salute all of the women who have been our mothers in the struggle, and all mothers in their struggle to provide for themselves and their families as best they can. WORD would also like to invite mothers to join us as we struggle for full equality for all women. We are mothers in the struggle -- Join us! My name is Sarah Lee Samonte and I am a WORD Mama from Los Angeles. I am a single mother that plays both Mommy and Daddy to my little butterfly Sally Rose. She is six years old. At first I joined WORD for myself, to get involved and learn more about feminism and attacks on women’s rights. As time has passed, not only did I know that attacks were happening to women around the world, but to children as well. I love being a mom! WORD has become an amazing stepping stone for Sally and I. WORD has become something we can do together. She loves the rallies, marches and all the activities we take part in. We have learned and fought together. WORD gives women strength and reminds you that you're as strong as a diamond with a heart of gold. Sally is amazing all the way around, but will eventually experience these unrighteous attacks against women and will continue in the struggle. Sally is going through our own attack from her biological father, but we stand strong and full of will. I am reminded of domestic violence and every nightmare a woman goes through when a male figure or any person tries to make one feel threatened. Not us, we're not weak, we FIGHT BACK! WORD reminds you that you are not alone, you are not blamed for or put to shame for going through any unfortunate circumstance, you are a remarkable being and you will heal and be even better. Sally and I will continue to take on all struggles with WORD as a whole. I see it as a gift I give to her every day. She learns and gets to hang out with her aunts. I’m part of WORD because I want my kids to know that their mom doesn’t go along with the status quo. I want to teach them to stand up against what is injustice. It is really a crime that women are not guaranteed the right to control their bodies, that women do not earn an equal wage to men for equal work, that women are constantly subjected to objectification and violence. WORD fights for equality, and against racism and anti-LGBT bigotry. I’m in WORD because the organization is part of the struggle for people’s basic rights—including adequate nutrition, healthcare, quality education, care for our elders, housing and jobs. Through WORD I’m able to contribute to these struggles and connect with women who inspire me every day. As girls and women, we stand tall and proud for what we believe in. We are not afraid of how we are perceived, or the status quo, or the indifference that permeates our society. Change comes when one is bold, honest and unafraid. And when we speak truth to power, those who have been waiting in the wings for a chance to fight injustice will come forth and become leaders. WORD is a vibrant grassroots organization that is taking the struggle for women's rights out into the streets, into communities across the nation, where people from all backgrounds can join the historic struggle for full reproductive rights for women, and parity in the workplace. I joined WORD because being a woman shouldn't be a disadvantage, and being a mother shouldn't hold anyone back. I joined because I want to be in the struggle for change. WORD is teaching me to be a fearless advocate for women's rights, LGBT rights, and workers rights locally and nationally. As a mother, I joined because I want my son to recognize injustice and inequality and stand against it. I want to teach him that we all deserve equal rights and I want him to know that it's okay for people to love whomever they choose. Across the country, our sisters in the fight are in the streets demanding our rights and rejecting patriarchy. I stand with them, I stand with our sisters all over the world, single mothers, working mothers and women, and I join them in the overwhelming hardships and joys we face. 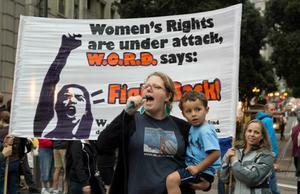 WORD is dedicated to the defense of women's rights and the fight to demand equality. I am proud to stand with an organization that values women and does not back down from the struggle.